in a new infographic. As live events increasingly lend to mobile use, make sure your related content is easy to access on all devices. The country has been going mad for college hoops over the past few weeks. 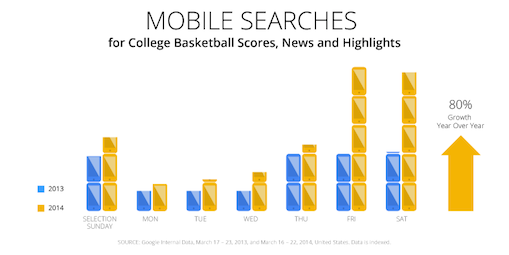 This year, we saw an 80% jump in mobile use for college basketball news searches during March Madness. As the Final Four prepare to duke it out, Think with Google takes a look at the latest trends they’re seeing in Google and YouTube data and explores what they mean for your next event strategy in a new infographic. As live events increasingly lend to mobile use, make sure your related content is easy to access on all devices.